Jesus IS Lord! God’s plan was purposed in Christ. God’s plan centered on Christ coming at the right time. God’s plan was to bring unity in Christ by making him Lord of all! 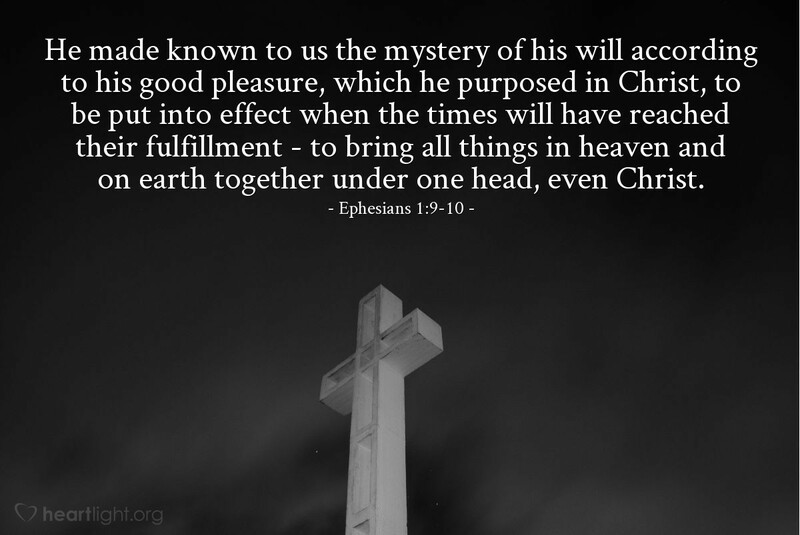 What’s more, this plan that brings our salvation brings God great pleasure. God is the only saving God. Jesus is both our Savior and Lord. So the real issue we face today is this: What area of our lives, our hearts, our secrets, our sin, our rebellion, have we not submitted to his lordship? O Precious Father, I know my heart can be deceitful. At times I can even fool myself. But when I kneel in your presence and am convicted by your Word, I find myself reminded of those areas I have not yet fully submitted to your control and Jesus’ lordship. Please, dear Father, use the Holy Spirit to gently show and convict of my self-deception so that I may be wholly lost in your will. In the name of Jesus, Lord of lords, I pray. Amen.